Over the next few weeks, competing campaigns will overwhelm voters in the city of San Diego with pitches about what to do with the old stadium land in Mission Valley. 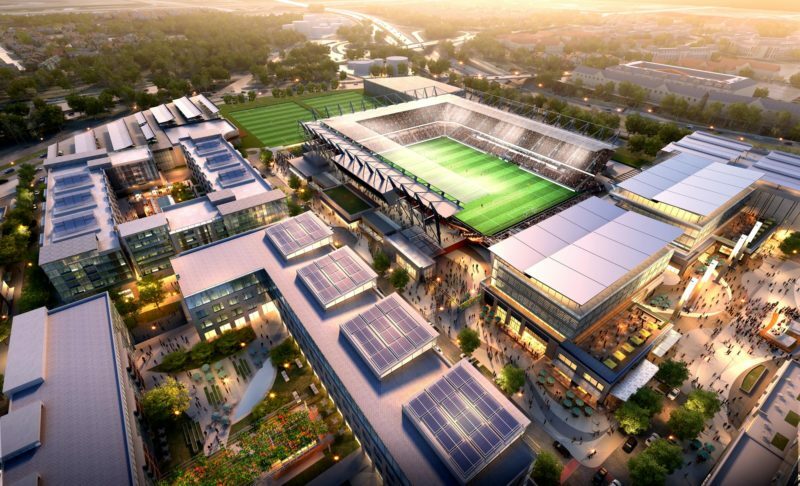 SoccerCity will be making pitches for its comprehensive development plan, Measure E, and promise to lure Major League Soccer to the region. On the other side, though, is virtually every major political institution in town — from the Democratic Party, to the most active labor unions to the conservative Lincoln Club. They prefer Measure G, which would simply mandate the city sell the land to San Diego State University. The university has its own plan for the land. It wasn’t always this way. For a year, SDSU and the investors behind SoccerCity worked closely as partners, under the close eye of Mayor Kevin Faulconer. The negotiations ended badly. How the idea for SoccerCity emerged, and how the investors forged a partnership with SDSU and then how it all fell apart, is a story about how San Diego’s elite can hatch big ideas only to crush them. In a special reporting project, Scott Lewis went behind the scenes to find out what exactly happened. A report by a committee of community members and education professionals concludes that San Diego Unified’s exceptionally high graduation rate in 2016 was bolstered by the fact that many low-achieving students left for charter schools. It confirms much of what VOSD previously reported. Will Huntsberry writes that the findings of the committee took longer than expected and some committee members had to fight to get their recommendations in the final version. Over on the podcast, Lewis and co-hosts Sara Libby and Andrew Keatts consider the school district’s shift in tone. Last year, officials responded to the news in a particularly aggressive way. Now, the school board president acknowledges that some low-performing students have been counseled for years into transferring to charter schools. A Superior Court judge ruled Friday that an El Cajon physical education teacher’s fight to get his job back will proceed over objections by the Grossmont Union High School District. Joshua Barney was fired by the Grossmont district following reports in early 2017 he inappropriately touched and talked to students in a weightlifting class. Barney appealed, but a state commission upheld his firing earlier this year. Barney is appealing that decision in court. Grossmont’s attorneys attempted to get the case tossed by arguing Barney failed to name the district in the lawsuit in a timely manner. The next court date is scheduled for October. Changes are coming to SANDAG. As Keatts explains in the Politics Report, the agency’s new voting structure makes it possible that a Democrat could rise at the end of year to become the new board chair. Hunter’s opponent, Ammar Campa-Najjar, was invited last-minute to a rally for Democratic House challengers in Anaheim at the request of President Barack Obama. U-T columnist Michael Smolens writes that the decision to campaign with Obama is risky in the 50th District, which voted overwhelmingly for Trump in 2016.
Who needs skits like “The Californians” when California parodies itself just fine? Sara Libby rounded up three times the state out-California’d itself in the Sacramento Report. The U-T sheds some light on yet another dispute among Southern California water officials. The San Diego County Water Authority wants to know how its mortal enemy, the Metropolitan Water District, calculates water rates and is taking its case to the state Supreme Court. Next time you’re waiting in line at the Otay Mesa Port of Entry, make sure to look for Francisco Vega, who went viral on social media for being the “sexiest” churro vendor. The Morning Report was written by Jesse Marx, and edited by Sara Libby.